I’m too tired tonight. I’m just not in the mood. I’m talking makeup and the excuses women give on why they don’t always remove it before bedtime. If clogged pores, blackheads and pimples aren’t on your beauty must-have list, I highly recommend you cleanse nightly…and, when you’re too exhausted to bother with the whole nine yards, a facial cleansing cloth is good in a pinch. My favorite? 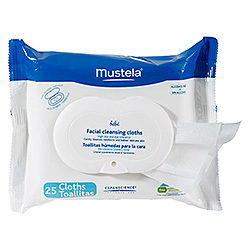 Mustela Facial Cleansing Cloths, $8.00 at sephora.com. I’ve been known to use them before bed but I really love them post-workout. They’re formulated for newborns and babies’ delicate skin so they never irritate my sensitive complexion and I love, love, love the fresh, light scent!